The main component of the dryer is the reversing and conveying machine called WendeWolf®. 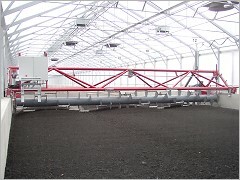 The machine runs on two parallel walls 12 m apart, 0.85 m high and up to 120 m in length. 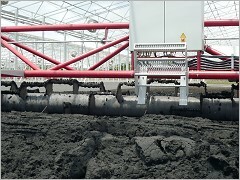 The central part is a drum on which different combs and paddles are fixed which cut the sludge's surface and aerate the lower parts. The drum can be lowered from a free height of 50 cm to the ground with a central motor and two toothed racks which are mechanically linked. The drum turns with a frequency of up to 60 c/min and conveys the sludge below while slowly moving. The unit can move and rotate in both directions and is controlled by frequency driven motors. It is fully equipped with sensors and control units. The WendeWolf® is mounted ready for use and transported in a container to the site. An operating panel with a touch screen is mounted beside the drying bed. The installation and commissioning requires only two days.